As teachers we are faced with educating a diverse group of learners each and every day. We have an opportunity to inspire them or an opportunity to kill learning and creativity. Every year I try to change up my instruction for a variety of reasons. When you get too comfortable in teaching the same grade/material, I feel as though students are less engaged and it is reflected in their performance. It could partially be do to teachers not having excitement over the curriculum. I want my classroom to an environment where students are excited to learn and showcase their learning in new ways. Is it there yet? No. Are there areas that I’m working on? Of course, but that’s why I continue to grow and learn from others via blogs, tweets, books, and podcasts. Excuses certainly don't benefit student learners. Nothing upsets me more than when teachers make excuses constantly and resist change. Yes, change might mean you can't use a lesson you've used for year or that it might require extra prep and teaching to students. The world is constantly changing, jobs are changing, and if you aren't evolving as an educator, you are holding students back from so many different opportunities. We have to learn to get comfortable getting uncomfortable to constantly be growing in our profession. When we have a growth mindset, it shows to our students. When you have low expectations for students, expect low results. When we stop making excuses and starting expecting more from our students, they can produce some amazing things. I've been told countless times, "that might work in your classroom" or "you can just do that in your room." Really? Have you been in my room daily? Do you know the relationships I have with my students, the conversations we have shared, the hurdles we have faced? If not, quit making excuses and take a risk. Is trying something new going to ruin your whole class? I doubt it. Set high expectations, maybe have an "if only my students could do...." goal and work towards it. Ask others for help and be okay with asking for help. I am blessed with an administration that is accepting of me taking risks in the classroom. We push each other in our thinking for what is best for students. I know that I can take a risk, have it go in a variety of ways, and not be afraid if it is a total bust. 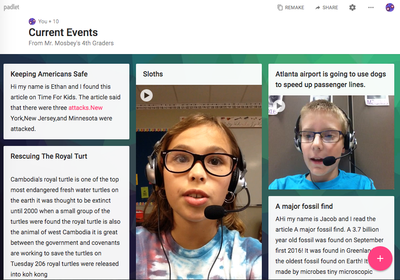 When I started this website, it was for showcasing what students in primary grades could do with technology. I was a fan of everything technology and wanted to always try and find the next big thing. Being a new teacher, I was discovering my teaching method and evaluating what I was doing in the classroom. Fast forward a few years and now I am in my sixth year of teaching. I'm less about trying to use as much technology and focus more on instruction. If students aren't receiving quality instruction, technology isn't going to help them. Technology amplifies teaching, whether that is good or bad teaching. Primary Tech Teaching is not focused on three areas: Primary Sources, Technology Integration, and Teaching Strategies. All of these can be used together to create a classroom that both teachers and students enjoy being a part of throughout the year. Snapchat videos offer other people the ability to look into our classroom and see learning from their perspective. The built-in microphone allows the viewer to hear discussions, thinking, and view students working and learning. 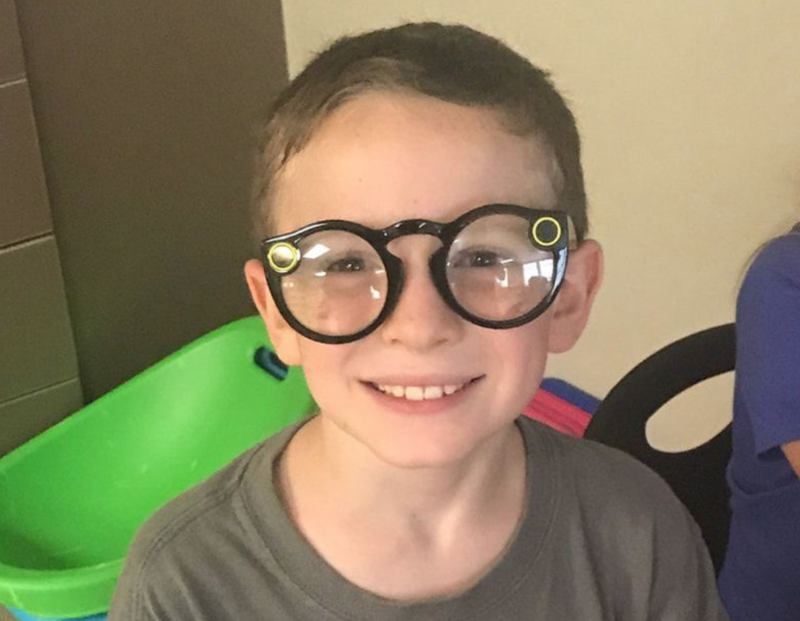 Each day we have Snapchat Student of the Day that wears the glasses and records insights into our room. Students have a list of options of different things they might want to highlight throughout the day. We can up with a list we created together at the beginning of the year. They chose items such as Morning Meeting, reading a book, solving a math problem, having a discussion with a friend. They even decided to share different areas of our room and explain how we use different technology tools. Students can record as little or as much as they would like. Below are some clips that I took when talking about math strategies during conferring. The videos are synced with the teacher iPad, videos are screened, and then added to our Snapchat Story. It's cool to view the videos because you can turn the phone and see different angles from their perspective. You can also save the videos and can be shared out on other social media. If you'd like to view our class account, you can at @PREMosbey. One of the changes I wanted to make with my classroom this year was to make sure that they were sharing their learning with others. When you give students an opportunity to share their work outside the classroom walls, they typically will produce better work. 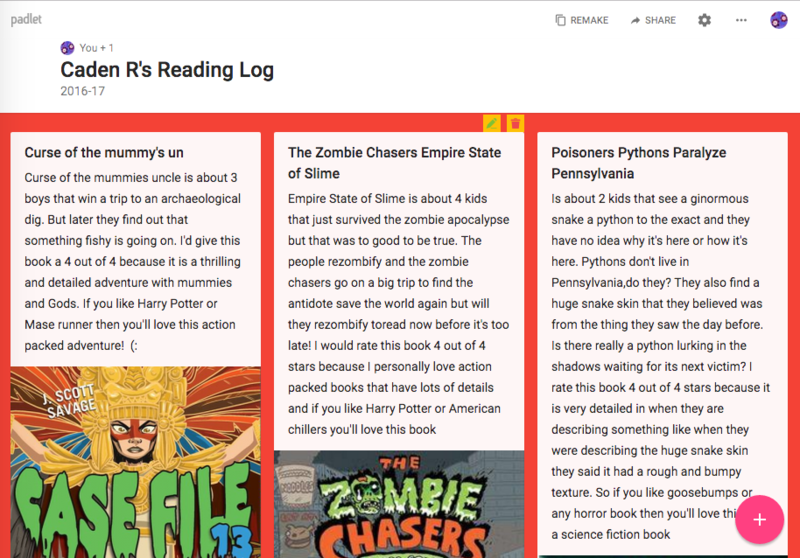 Padlet was one tool that I wanted to use more with my students. We use them a lot for literacy tasks. Students are writing book reviews, sharing current events, as well as keep track of their reading logs. 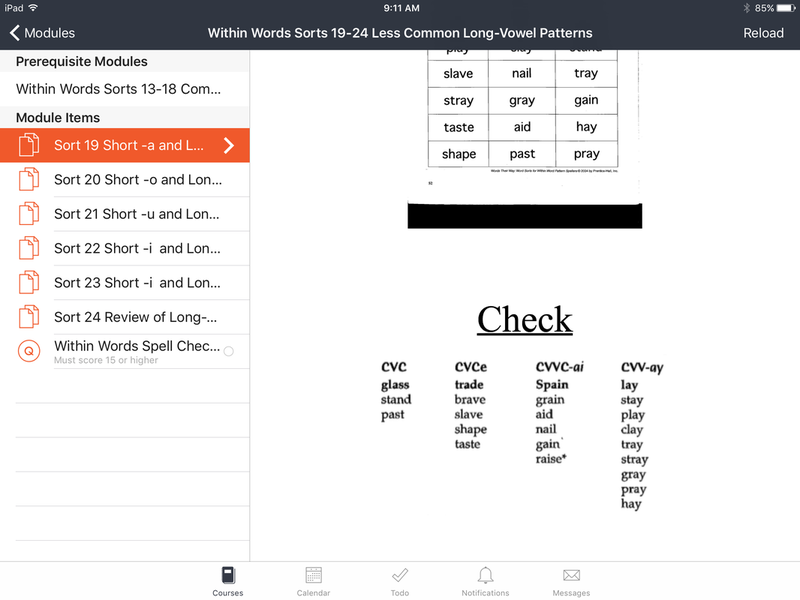 Students have the ability to type in their response or record videos. If you want to have extra long videos, I would recommend their Backpack package, which is $5/month or $45/year. With me transitioning from 4th grade from 1st, I knew it would be a good time to switch things up a little bit in terms of classroom design. The funny part about me moving grade levels and classrooms is that my new classroom has the exact same dimensions and is in the same spot, but just on the opposite side of the school (our building is set up with hallways for K-2 and 3-5). With this change I wanted to create at least one space that showed how we are working together to achieve great things. I'll admit that I hate themes. I know that hate is a strong room, but I don't understand why people spend hundreds of dollars to have all these decorations around their classroom. Do lights, crazy furniture, and things hanging from everywhere really help the learning environment in your classroom? Research can always be skewed, but I really doubt it. I believe less is more when it comes to decorations and too much can be very distracting. Over the summer I heard a quote from Kristin Ziemke that really stuck with me. 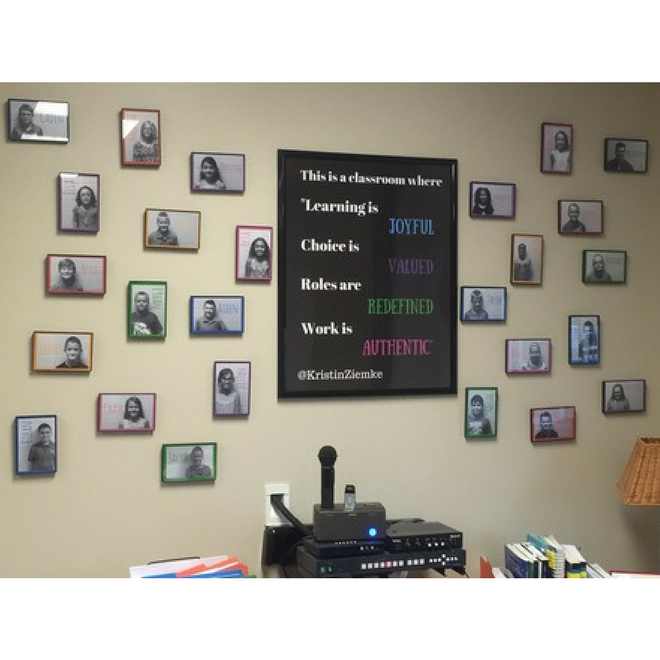 "Dream of a classroom where...learning is joyful, choice is valued, roles are redefined, work is authentic" I'm not a person that is a huge fan of quotes and they hardly ever speak to me, but I knew that I wanted this quote of hers to be visible in my classroom. I decided to use Canva to create the poster. If you've never used this tool, it is time to start. Shoot me an email if you're interested in the poster. The first day of school I took a picture of all my students. I once again used Canva to add a background and their names. The frames I used were the $1 from Walmart and used 3M hangers to hold them on the wall. The response from families has been great. Students love seeing their faces on the wall and it shows how all of us are working together, growing together, and learning together. For those that have used Words Their Way and teach a primary grade, you know that it can take a long time for them to cut out their sort. Over the next few days you find tiny pieces of paper on the floor because students forgot to initial their pieces. When they finally glue their sort, you have students that decide to glue the whole page instead of just their pieces. Those reasons are why I decided to digitize their Words Their Way sorts. Goodbye cutting, gluing, and making copies all the time for your sorts. I started to digitize the sorts last spring. My students are great at giving honest feedback about trying new tools. After a week they decided that this was the way to go. The app I used was Corkulous Pro ($4.99). There is a free version, but I use the paid to have multiple boards. For those not familiar with this app, it is a cork board-type app where you can add photos, to-do lists, stickies, note cards, and a few other features. The process for creating the boards is a little tedious. Once you get the hang of it, it is not that bad and you can create a board in 15 minutes. The file is attached on how to create a sort and prepare it for students. 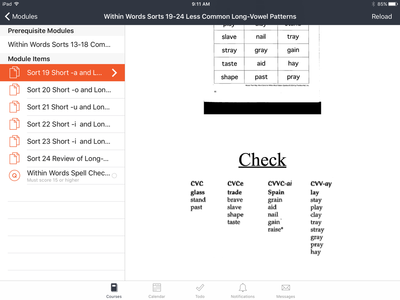 ​ I've also included an example from a sort that you can use on an iPad..
Below is an example from a student. This shows me what they know and how I can support them to better their understanding. If you've read my blog before, you know that I really like Canvas. More features are being added all the time and it has become an integral part of instruction in the classroom. Here is part of my Canvas page. My WTW groups are dessert groups-brownie, cupcake, and ice cream. (Yes, not typical, but I was hungry and already used colored groups for guided reading.) Students click on their dessert picture, which is set up as a button, to find their module and then find their sort. I have video explanations of each activity that students get stuck and need directions repeated. A perk of Canvas is not having the same thing over and over again. The sorts are set up so that they can Sort, Write, and Check. Since students can go at their own pace, I make sure that they turn in their activity each day. They can only click on that day of the week because the other days are set up to be locked. I also provide them with a paper copy of the lists of sorts and have them write down the date when they complete an activity. An image of this paper is below. 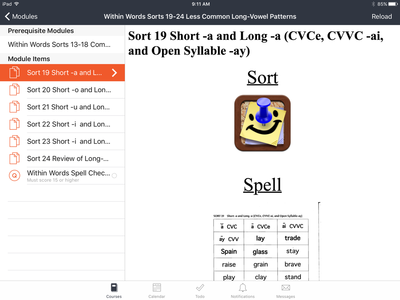 The sorts are set up into modules based of the sections of the book and each module ends with an assignment, which is the same as the Spell Check in the book. Students have to score a minimum amount of points in order to move on in the modules. The upper modules are locked because I set them up so that the previous modules are prerequisites. If you have any questions, feel free to email me and I can help you out if this is something that interests you. My students really enjoy it, it saves me time in the long run, and easier than looking through lots of notebooks.